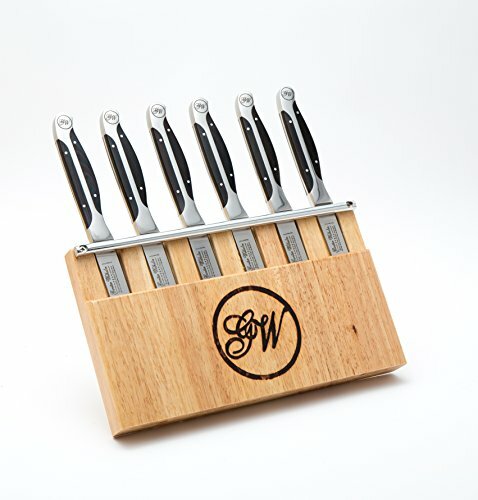 Gunter Wilhelm Executive Chef knife collection is designed for the professional chef and passionate cook. Made from X50CrMoV15 High-Carbon German Steel and manufactured with state-of-the-art technologies, the Executive Chef knife delivers superior cutting characteristics. Gunter Wilhelm innovative and patented Triple-Tang handle design introduces a well-balanced blade with a beautiful look. Once the perfect design was completed the right steel had to be selected. Selecting the right steel for cutlery is a very complicated matter. There are many different aspects that will affect the steels performance. Many factors affect a blades properties and performance. The choice of metal is a major factor which will affect the blades performance and properties. Many years ago all blades were made from high carbon metals. This is the best way to make high end blades that will last longer and be razor sharp. About 30 years ago a new alloy High Carbon Stainless (no-stain) steel series was developed. High Carbon SS blades can be sharpened and can maintain an edge. They will not rust if not left in water or put in a dishwasher. Please note that every knife can rust. The key is to avoid the dishwasher and dont let them sit in water. The next major factor in knife performance is the heat treatment. A good heat treatment will enhance the steel and bring out its best features. The Gunter Wilhelm Executive Chef Series has a special heat treatment and is ice-hardened. Our special heat treatment determines the hardness of the blade, how long the blade will stay sharp, how frequent the blade will require sharpening, and how easy the sharpening will be. Gunter Wilhelm is proud to say that our fine cutlery meets and passes the high requirements of the EN ISO 8442-5: 2004 standard Material and articles in contact with foodstuffs cutlery and table hollowware -- Part 5 Specification for sharpness and edge retention test of cutlery. This standard ensures that the materials used to manufacture your Gunter Wilhelm blades are safe for use with food AND that our fine blades meet the standard requirements for sharpness and edge retention. If you have any questions about this product by Gunter Wilhelm, contact us by completing and submitting the form below. If you are looking for a specif part number, please include it with your message.